The most awaited racing event of the year is here! You guessed it right – The Melbourne Cup is just two weeks away and there is already excitement in the air. Melbourne Cup is known to unite people across Australia – some go to the racecourse to experience the thrill with family, some spend hours getting entry to the most happening party in town, while some others take it as an opportunity to host a corporate event. Organizing a corporate event at the race gives many businesses an interactive platform to network with their clients and employees. It also acts as an occasion to promote their brand. If you are the one entrusted with the mammoth task of planning your company’s corporate event at this year’s Melbourne Cup, but are an event planning novice, worry not! Holland Party Hire has put together a guide to help you plan a memorable event. It is a misconception that having a budget can tie your hands. It is always advisable to have a budget earmarked for your corporate event. This can help you keep an eye on unnecessary expenses and ensure you don’t overspend. If you are hosting your corporate event at the racecourse, book ahead to ensure you get a corporate box suiting your size specifications. If you are planning to organize the event at an alternate venue, keep your options open, choose a venue at a central location and book well in advance to avoid last minute booking hurdles. Given Adelaide’s unpredictable weather, you never know when the rain Gods start smiling! Prepare ahead for any unforeseen weather situations and get a professional marquee to cover your corporate box. 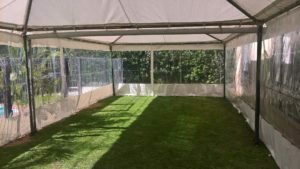 Holland Party Hire’s exclusive range of water proof marquees will keep your guests protected against not just rain, but also harsh sun or extreme windy climate. Catering forms a big chunk of an event planner’s budget. The food you serve at your Melbourne Cup corporate event can make or mar the success of your event. Keep it classy and keep it simple! Having an elaborate spread that is neither presented well nor tastes good is of no use. Sample the menu before the event and remember to include gluten free and vegan options in the menu. If you are sending out RSVP cards, it will be handy to include an option for preferred meal suggestion. Looking to cut down on cost? Opt for a buffet style set up instead of a sit-down one. This will save you many dollars on hiring waiters. That’s the million-dollar question, isn’t it?! While most guests to a Melbourne Cup Corporate Event expect to be served liquor, whether to serve or not is entirely the host’s call. If you must, keep a selection of few good wines and a mix of local beers. Don’t forget to stock and serve juices and soft drinks as well to give your guests options. Chairs or lounge style seating? 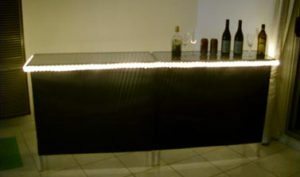 Bar tables, café tables or LED tables? Flowers or frills? Styling your corporate box or event venue can be daunting. With so many options and material available, it can often end up confusing you. Our suggestion? Hire a professional decorator to style your event. With an extensive range of seating, tables, tableware, glassware and lighting options available, Holland Party Hire can help you transform your plain corporate box into any theme you desire. On a racing day as busy as the Melbourne Cup, you don’t want your brand to get lost in the crowd. Decide how you want to promote your brand making the optimum use of the space you have. From having your logo printed on the napkins, disposable tableware, to race guides with your branding, directional signage guiding guests to your venue or corporate box to photo booths – there are options galore! You can also create an exclusive social media hashtag with your brand name and ask guests to tag the same in their event pics. If you want to create a memorable experience for your guests in your corporate event, it is best to get professionals in. Holland Party Hire can help you put together a Melbourne Cup corporate event that will be talked about for a long time. We have you covered for everything you may need – ranging from marquees, tents, chairs and seating arrangements, to tableware and glassware, linen, catering equipment, lighting arrangements, and much more! Only thing you be left with is to invite your guests, be there at the venue on race day and have a gala time!